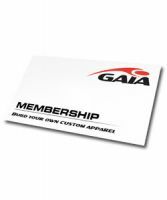 The GAIA Europe Member Program helps you save on gear. Membership benefits include up to 25% off all retail prices, exclusive first look at new gear and the occasional email update on deals and what we've been doing lately. Valid for one full year from date of purchase. This Product was added to our catalogue on Tuesday, 18. December 2007.